Organic. Great British oats for healthy hearts. Brilliantly British. 100% wholegrain. Naturally high in fibre. Suitable for vegetarians & vegans.Great for porridge, our versatile organic oats are also fabulous in flapjacks, crumbles, stuffing and baking, or try adding a handful to a fruit smoothie for a deliciously filling breakfast treat. Helps actively lower cholesterol* Natural source of protein** Natural source of manganese & zinc*** * Oat beta glucans have been shown to help lower blood cholesterol. Blood cholesterol lowering may reduce the risk of coronary heart disease. 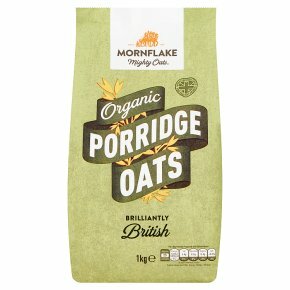 One 40g portion of Mornflake Organic Oats provides 1.6g of beta glucans from oats, which is 53% of 3g, the suggested daily amount; ** Protein contributes to a growth in muscle mass and the maintenance of normal bones; *** Zinc contributes to the normal functioning of the immune system, and both manganese and zinc contribute to the protection of cells from oxidative stress. (Recommended)1 In a saucepan mix 40g of Mornflake Organic Oats with 285mls (1/2 pint) of cold water. If you like your porridge creamier make with milk or a combination of milk and water.2 Bring to the boil and then keep stirring for 1 minute.3 Remove from the heat and stand for 1 minute before tucking in! 1 Using a large microwavable bowl, mix 40g of Mornflake Organic Oats with 285mls (1/2 pint) of cold water. If you like your porridge creamier make with milk or a combination of milk and water.2 Keep it uncovered and cook on full power? for 2 minutes then stir well.3 Cook for a further 1 to 2 minutes on full power. Then leave to stand for 1 minute before tucking in! ?Based on an 800W microwave oven. If your is different adjust the time to suit.